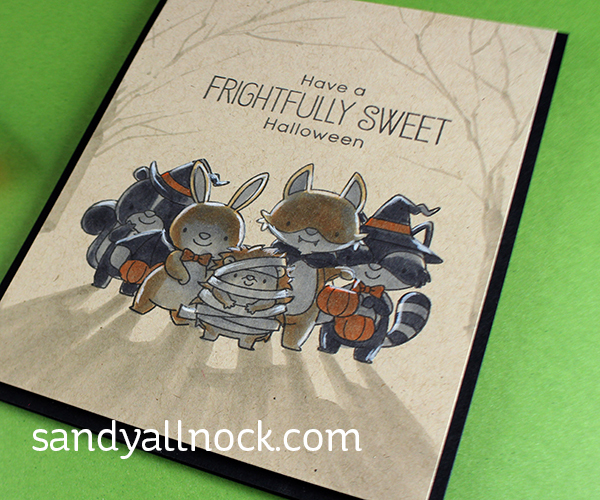 Every year I make a couple Halloween cards; I’m not a big fan of the holiday but the scenes can be lots of fun! I loved these critters from MFT….so I’m going to show you how to make a fairly simple scene. (More fall and halloween scenes can be learned in the Autumn Scenes Mini Class HERE). Watch the video below or click HERE to see it in HD on YouTube. And what a cute result! I’ve missed you. We got a new dog so I am now playing catch up. I got this stamp set a few weeks ago and can’t wait to use it. Great card Sandy, love that you made this on Kraft paper. I found your explanation how you made and why you made the shadows like this very informative. So as usual, I learned a lot from you, thank you so much and have a nice weekend. Love this! I’m inspired to give it a go. Wish me luck! So glad you mentioned that the critters behind had their feet slightly higher for perspective. It drives me nuts (and I don’t have far to go) when I see someone put an image in front of another yet it is higher up making it look like it’s floating. So much to learn when trying to make a little scene look believable. Wonderful scene. I like the shadow and how you made the front darker and how it still stood out and wasn’t a dark group of something. I love your techniques. Always thanks for the videos.. (kinda looking forward to rain to clear this Wa. air.. So smoky down south and sure it is up north where you are.. Take care. Oh this is just too cute Sandy! Gorgeous animals in their cute costumes. Great effects with the grey but did think for one min you had lost plot after your colours work had got so darkly covered but as alcohol dried out all panic subsided again. Look forward to more spooky scenes. Such a darling card! 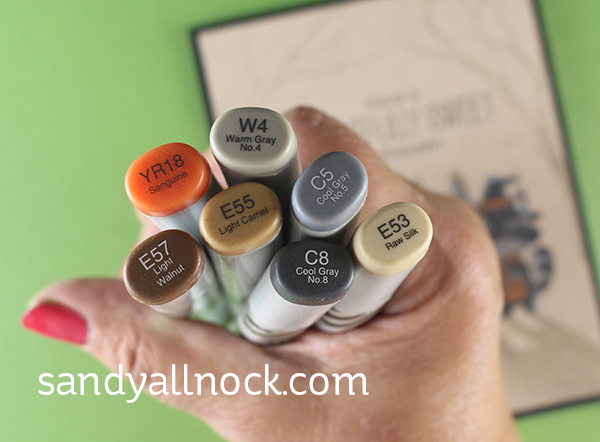 I’m in love with these cute images and the clever way you colored them! Thanks for the very informative video. I love how the critters turned out, standing in the moonlight. The trees really added to the spooky scene, too. Oh my !!! You’re sooooo good !! Hedgehogs and rabbits and crotches – OH MY! Haha – you crack me up! 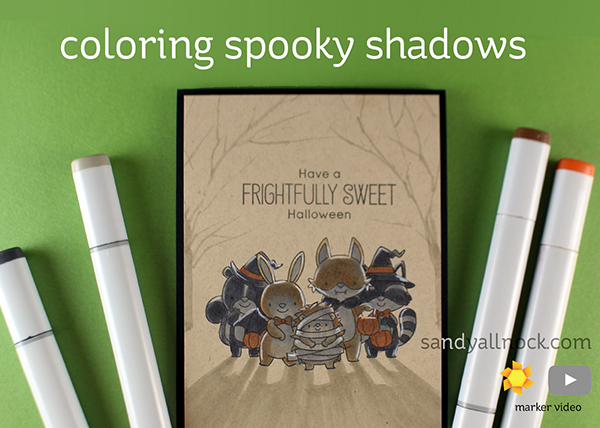 I think this will be the year I get brave enough to try some Halloween cards with “spooky lighting”, since you explain it so well and make it look so easy. Thanks for what may be the best 8 minutes of my day! I’m not a fan of Halloween either but this stamp set is gorgeous and your card is sooooo cute. I love the technique of putting grey over the critters to really emphasise the shadows. Thanks Sandy.